Who would have thought that the 2019 elections would be a desperate lunge for political posturing before survival with major national parties squabbling over Karnataka yet again, engaging in horse-trading, indulging in allegations and counter-allegations of poaching from each other’s camps and threatening to force mid-term polls with the Lok Sabha one. 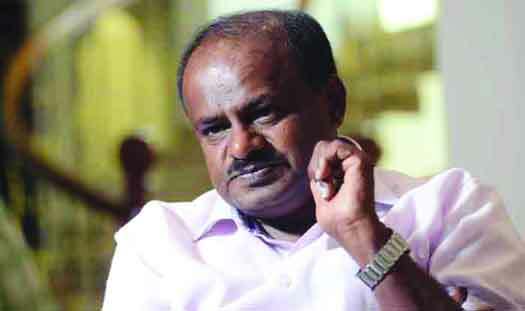 As of now, the Congress-JD(S) government led by HD Kumaraswamy is hanging by a thread with two disgruntled Independents withdrawing support and transferring their loyalty to the BJP saying that party can ensure stability by virtue of being the single largest. It is true that the BJP has not taken well to Karnataka paving the way for the very concept of mahagatbandhan politics nationally, the Congress squashing its edge as the single largest party by quickly tying up with the JD(S) in its quest for power. It has been antsy about seizing the narrative given its still creditable vote share and seats. Ever since, backrooms have been abuzz with speculation that the party would launch another version of “Operation Lotus”, the BJP’s successful poaching of MLAs from other parties during Chief Minister BS Yeddyurappa’s first stint, and supplant Kumaraswamy. Many BJP leaders had even publicly declared that though they had lost the battle, they would easily win the war given the inherent contradictions of the Congress-JD(S) alliance that would make it unstable in the long run. Now that the BJP has parked its own MLAs in a faraway resort in Gurgaon and is believed to be shopping for unhappy MLAs from the combine’s camps, it would seem the party is indeed trying to force a constitutional crisis in Karnataka, if not to prop up its own government but at least to create a sense of uncertainty and doubt in the minds of the voter about investing their hope in either the Congress or the federal front. The BJP currently has 104 MLAs, the combine 117. At least 14 MLAs will have to resign to make it possible for the BJP to stake a rival claim. Karnataka at the moment is strategic to the BJP as a gateway state. It believes it has the people’s mandate being the single largest party and its hold there would help it grow roots in other southern states, so crucial for picking up the buffer seats to make good the heartland losses for the Lok Sabha polls. Clearly, the Congress win in the Assembly elections had subdued the state BJP a bit. But now that there is an equal assertion by the federal front to go it minus the Congress — the consolidation of the SP-BSP in Uttar Pradesh, the equidistance by BJD’s Naveen Patnaik and Trinamool’s Mamata Banerjee — the BJP has resurrected its ambitious plans in Karnataka. If the Congress-JD(S) combine is shattered, then the BJP believes it would have a tactical advantage for the general elections. Surely, it has managed to send the Congress scurrying, it being the initiator of this alliance, with party general secretary in charge of Karnataka, KC Venugopal, slipping into damage control mode and finding ways and means of keeping the flock together, dangling ministries. The Congress has also threatened to engineer defections of at least six BJP MLAs. The larger question then is does it behove our political parties to engage in cheap political tricks of the medieval kind rather than working hard on the ground to gather votes and deliver for a change? Apparently grapevine has it that the going rate for MLA defections is Rs 50 crore and a ministry or Rs 30 crore for resigning and contesting again! Nothing but an attempt to delegitimise democracy itself.